Like art and technology? 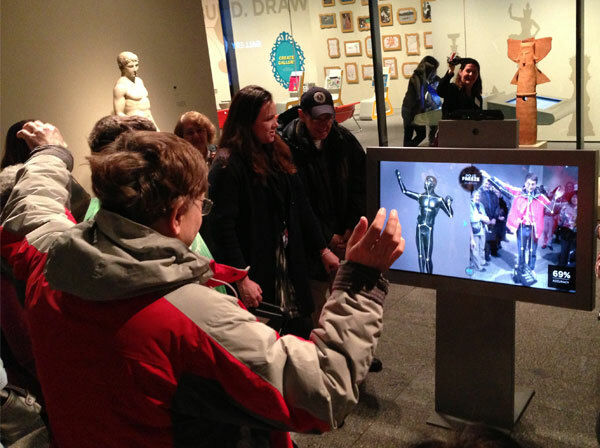 The recently opened Gallery One at Cleveland Museum of Art offers something for the whole family. Gallery One’s Make a Face kiosk, matches art up to your facial expression. images from the museum’s world-renowned permanent collection. The experience is enriching, and categories and themes of art are visually presented and refreshed often. I was informed by a tour guide that each touch tile cost $8,000 and it is the only one of its kind in the country. One of the tiles was pulled off the wall for us to see the light source and electronics behind it. We were ensured that the wall screen is wiped down twice daily for cleanliness! Gallery One’s application matches your gesture to art. Draw any shape in the Studio Play exploring room on a kiosk called ‘Line and Shape’, and it visually pairs-up and displays a museum object using that shape, whether it’s an edge of a ceramic vase, or a design in a tapestry. Gallery One’s clay vessel creation simulation. 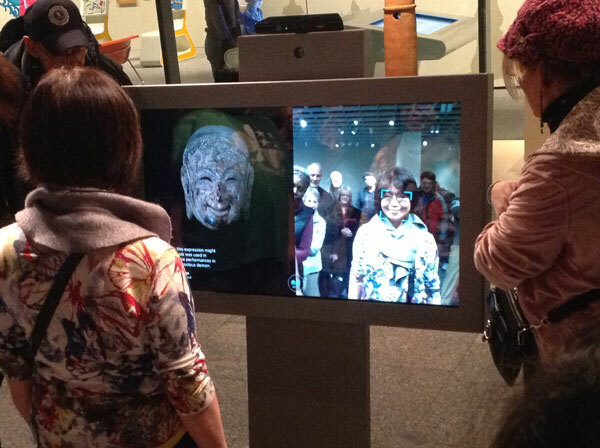 is matched to a face in the museum’s collection and displays them side by side. The same idea is used in making a body gesture by standing in front of the screen. A sculpture with a similar pose appears next to your image. 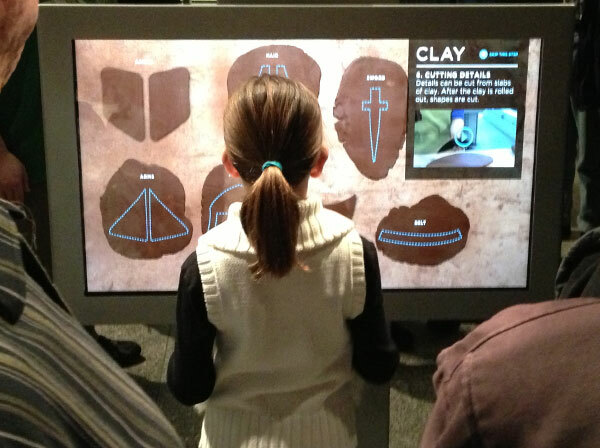 On the same kiosk, use the touch screen and take a slab of clay and roll it, cut it and create a vessel. 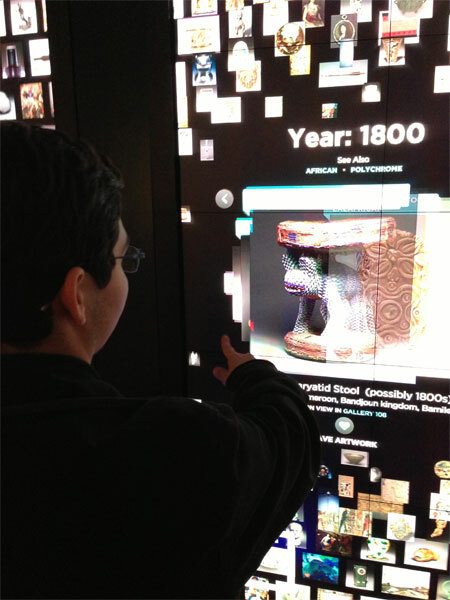 Gallery One’s image touch technology wall. Bring your iPad or rent one there for $5 (the rentals use a great iPad case called GripCase, available at the museum gift shop or online), and run the ArtLens free app (iOS only). You can download it at the app store prior to your visit, and enjoy information and videos about the Gallery One collection even if off-site. Utilize it there and get assigned a special plastic disc with a micro-chip to pair your tablet up with the touch wall. Scroll through images with your hand on the wall and find your favorites. Press a heart shape under that image and it will save it to your iPad in a favorites list. Then your iPad allows you to share those images by email or social media, or create a custom tour which can be saved and viewed later, which includes detailed information about those particular works of art. 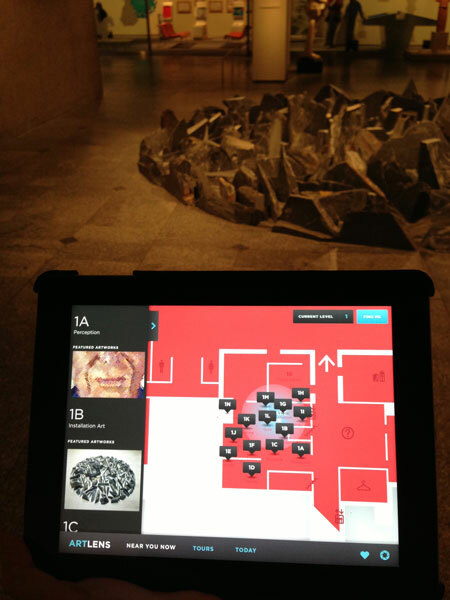 Gallery One’s near you now app feature. 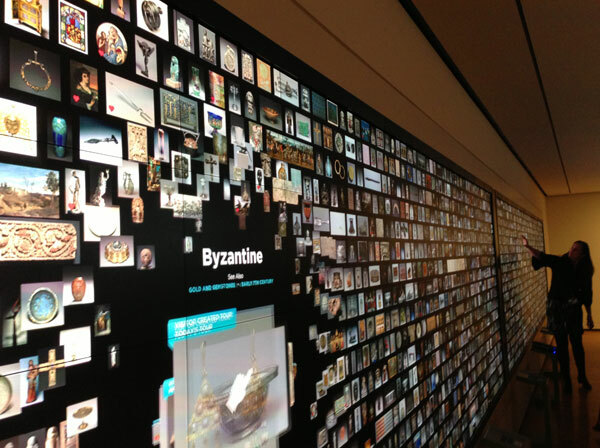 Gallery One’s ArtLens app gives information on art. Travel around the room in the Gallery One exhibit (I was told photo-taking works on your iPad is allowed here), use ArtLens to let your device show you where you are in the exhibit using the ‘Near You Now’ feature. 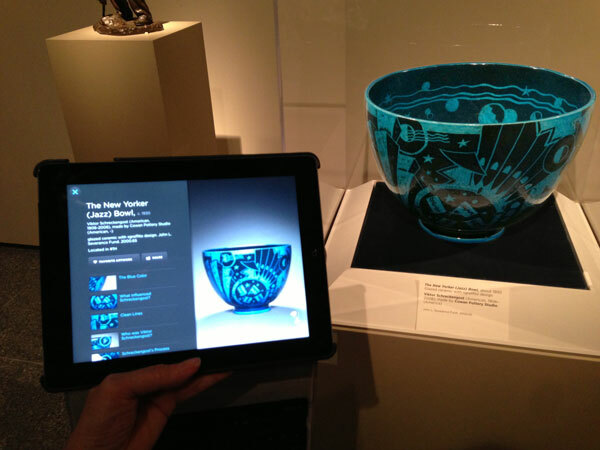 Hold up your tablet lens to a work of art, and your app will bring up a detailed description of that work of art which may include audio or video. Don’t want to use an iPad? There is a floor kiosk in each area of the Gallery One exhibit floor to allow you to call-up more information on the art you are standing near, or interact by taking polls. Works in this exhibit include works by Pablo Picasso, Auguste Rodin, Viktor Schreckengost, Giovanni Panini, and Chuck Close. A Gallery One interactive kiosk. 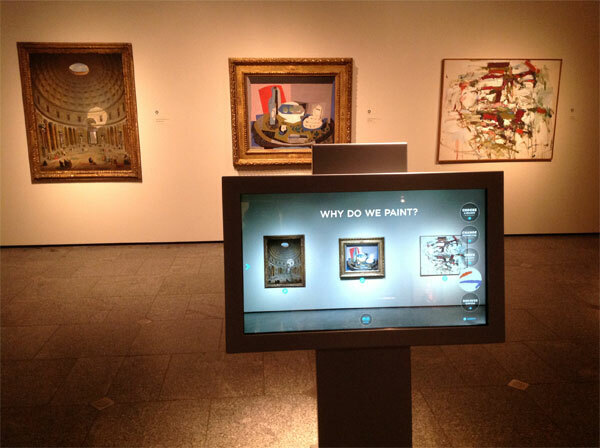 See all this and even more attractions at this wonderful art and technology-based interactive gallery. Also on your trip there, enjoy the space in the new atrium, visit the restaurant, and explore the fabulous new museum store. 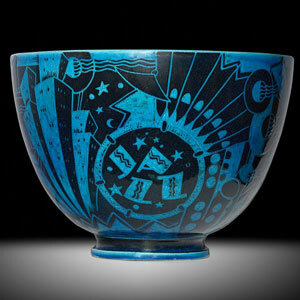 In the early 1930s, an Art Deco style masterpiece was created in earthenware with black and vibrant blue glazes and a jazzy New York theme, tilting skyscrapers, stars and other symbols — the “Jazz” bowl. It was designed by ceramicist Viktor Schreckengost. A web site is dedicated solely for Viktor’s bowls. It states in Viktor’s words that a design was requested, submitted and selected for a punch bowl with a New York theme while he was working at the Cowan Pottery Co. in Rocky River, Ohio, The client turned out to be Mrs. Franklin D. Roosevelt, and the bowl turned out to be the first of a series (and first of three that she ordered) that he designed. It is estimated there are between 20 and 50 of these bowls, though the exact number is unknown. Last weekend parade participants created a huge float version of a “Jazz” bowl and displayed it at the popular ‘Parade the Circle’ event in Cleveland. Rago Arts auction has one of the bowls with a Schreckengost signature and Cowan stamp in their June 16, 2012 auction, estimate: $40,000-$60,000. According to Kovels.com, a similar “Jazz” bowl sold at Rago in 2010 for $158,600, and the bowls have sold at other auctions across the country. The are in both public and private collections. Jazz bowl at Rago aucton. I was fortunate enough to see a “Jazz” bowl in person at The Cleveland Museum of Art’s exhibit “Viktor Schreckengost and Twentieth Century Design” a few years ago. You are currently browsing the archives for the jazz bowl category.